The playful humour and emotional sincerity of 2014's quirky, loveable debut, the mermaid romance Lorraine & Alan, already showed that Farnham-based Bucket Club stand out from the crowd of emerging Fringe theatre companies. Their follow-up Fossils is an even stronger offering, the story of uptight evolutionary biologist Vanessa's search for her missing father, and a hallucinatory trip up north to find out whether there's really a big monster in a certain Scottish loch. The excellent three-strong cast multi-task superbly between roles, as well as creating a live Sufjan Stevens-like soundscape from voices, harmonium, violin and theremin-like electronics. Helen Vinten has an intense focus as repressed Vanessa, and Adam Farrel is a natural comedy performer as her PhD student and sidekick Dominic, even if David Ridley's Miles feels a bit under-developed. But it's director Nel Crouch and designer Rebecca Wood's inventive, lo-fi staging that really steals the show, using the simplest of means – a few glass containers, a menagerie of model dinosaurs – to create a magical, melancholy world of loss and remembrance, and almost distracting you from the huge emotional resonances they're slowly building. Fossils' enigmatic closing scenes might feel rather abrupt, but it's a captivating, poignant reflection on love, longing and the importance of mystery in all our lives. Pleasance Dome, until 29 Aug (not 17), 2.40pm, £8.50--£11 (£7.50–£10). 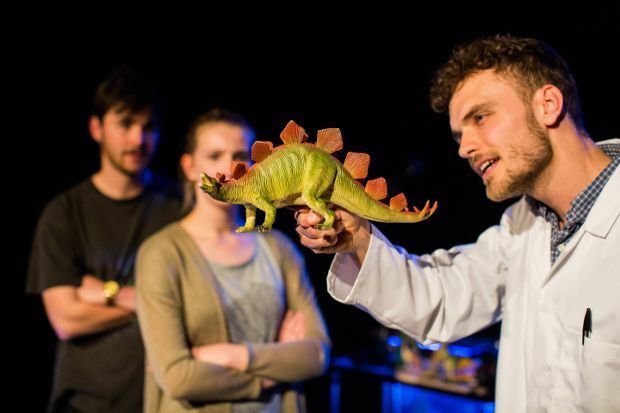 Bucket Club presents a contemporary drama about a woman's personal research project into the Loch Ness monster. Vanessa decides to look for the mysterious creature after her father's disappearance.